PDFCool Studio allows the user to convert any printable files, such as DOC, HTML, PPT, JPG, JPEG2000 etc to PDF documents. You can combine and convert multiple format files to a single PDF document, or convert multiple format files to relevant individual PDF documents. 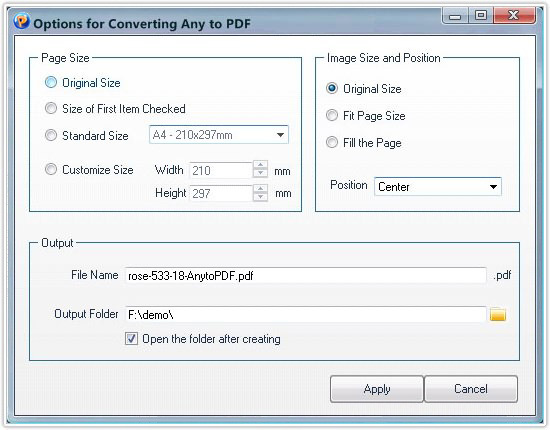 Check files you want to convert to PDF documents in the list box. 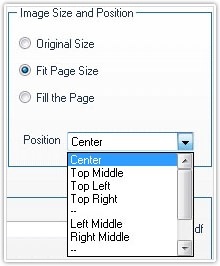 Then, click "Create PDF" button to open the "Options for Converting Any to PDF" dialog. 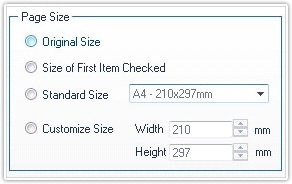 Check the "Customize Size" option, you can customize the width and height values of the created PDF document. 7. Click on the Apply button to finish "Any to PDF" process.